The easiest way to get to the field is to take Highways 270 or 141 to Highway 21 (Tesson Ferry Road). At the North end of the bridge where 21 crosses the Meramec River (near Highway 141), there are slip roads (on the North or Southbound sides) down to Butler Hill Road. Follow one of these down and take a right. The field is about 100 yards up on the right. Note - do not find Butler Hill Road on a map or follow Highway exit signs to Butler Hill. Butler Hill winds around all over the place and "disappears" in places, so you are likely to get lost. 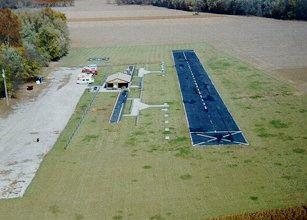 Here is a picture of the flying field taken from Skip Delius' RC plane fitted with an on-board camera.